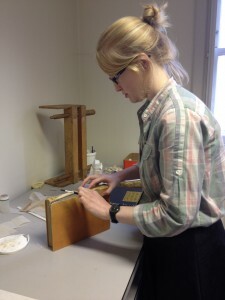 This post comes from Brian Ryder, one of our volunteers here at Special Collections. Brian’s history with Reading collections is a long one; he used to be one of our project cataloguers and is now working his way through the Routledge & Kegan Paul archive. From September 1943 until January 1945 A/C [Aircraftman] Eric Partridge was a clerk in the RAF living and working in Wantage Hall, a hall of residence requisitioned from Reading University. Born in 1894 in New Zealand, Eric moved with his family to Australia in 1907. In 1915 he joined the Australian army and saw active service with the Anzacs in Gallipoli and on the western front. In the 1920s he came to England and taught at a school in Lancashire and the universities of Manchester and London before abandoning teaching to become a ‘man of letters’ and owner of a publishing house with the imprint Scholartis Press. One of its early publications – with the liberal use of asterisks – was Songs and slang of the British soldier which he co-edited with John Brophy using material they had accumulated during their own war service. The publishing house foundered in the depression but by the outbreak of World War II Partridge had established a reputation as a lexicographer and etymologist only for his main publisher – George Routledge – to be taken aback when in September 1940 he enlisted in the King’s Royal Rifle Corps. This incident made no difference to the intransigence shown by Routledge in responding to Partridge’s suggestions for new books or for the reprinting of his back-list; all were declined, mainly on the grounds that they only had paper – which was rationed – for books they considered more important to the war effort. Almost every one of Partridge’s letters for the rest of the war protested his financial difficulties. Partridge became a civilian again in January 1942, his reasons for this given to his publisher being health (he had recently told them of an operation for piles) and domestic. But on 31 August of that year he wrote to Franklin to say, ‘Are you perhaps forgetting that I must work for a living? Your rejection of my ideas renders it probable that, in three, or even two weeks’ time I shall be obliged to re-enlist in the Army (as a private) or to enlist in the RAF (ditto).’ War Office bureaucracy ensured that it took until December 1942 for him to be found in the RAF as a clerk, general duties. During his later service when at Wantage Hall, Reading he would have been well-placed in any free time he had during the working week to check on Routledge’s claims to be unable to obtain paper for his works because the Paper Control Office of the Ministry of Supply was located in the Great Western Hotel near Reading railway station; however, his letters to Routledge contain no mention of his having done so. On leaving Reading, Partridge was to be found working in a Public Relations Office at the Air Ministry in Whitehall where he remained until demob in July 1945. What good came from Partridge’s time in the forces? What made him enlist? Just one brief sentence in a letter to Routledge may give a clue – ‘My ears are open for R.A.F. slang and colloquialisms.’ In 1948 Secker & Warburg published A dictionary of Forces’ slang 1939-1945, edited, and the air force slang contributed by, Eric Partridge. 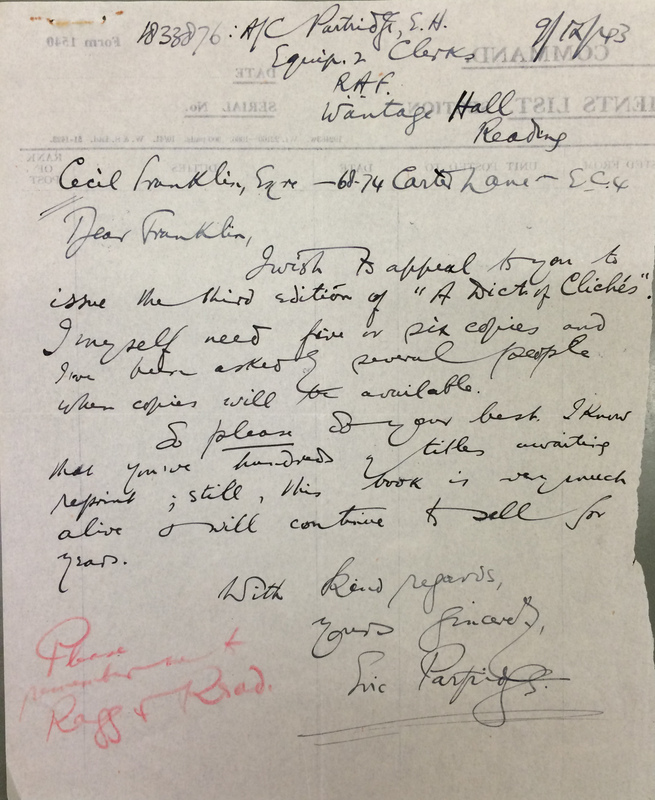 The University of Reading’s collections hold a great deal of Partridge’s correspondence. For more information, please see our catalogue or our records of British printing and publishing firms. Today marks the anniversary of the birth of Aubrey Beardsley, a favourite artist among staff here. 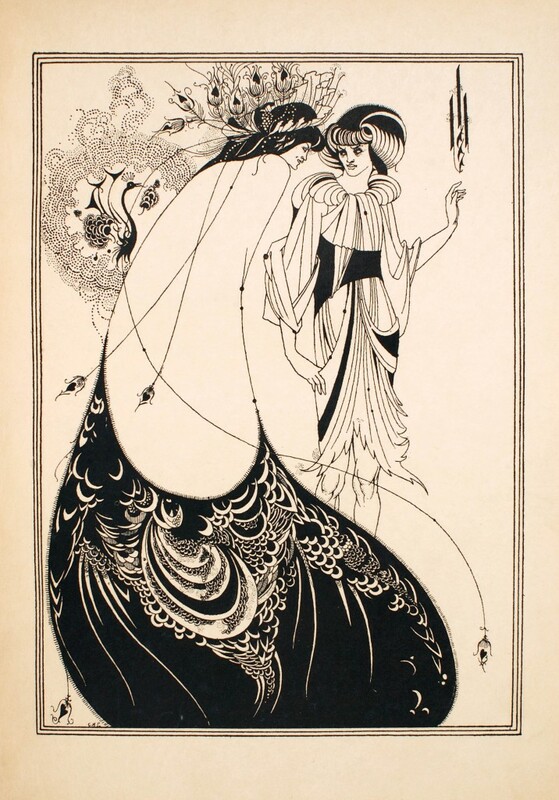 Aubrey Beardsley was born in 1872 and died from tuberculosis in 1898 at the age of only twenty-five. 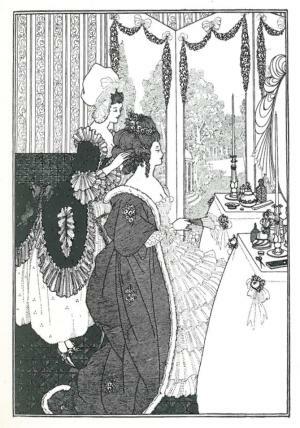 During his short and brilliant career he became notorious for his illustrations in two ‘decadent’ periodicals of the period, The Yellow Book and The Savoy. His designs and illustrations for books such as Le Morte D’arthur, Lysistrata, Salome and Volpone added to his notoriety as the most daring artist of the 1890s. Please do take a look and enjoy his absolutely stunning work! 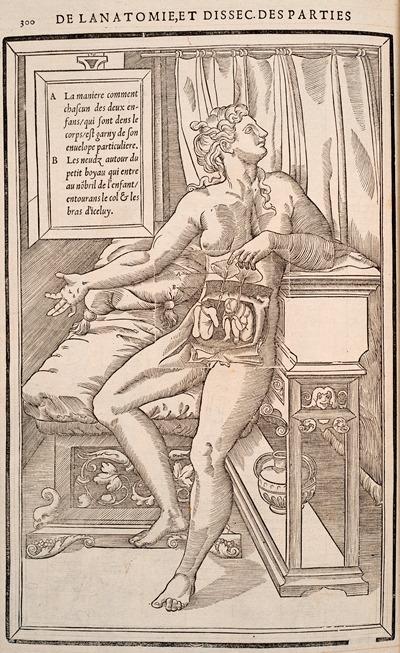 Plate: ‘The Toilet’ – Belinda at her dressing table. The role of GT here at UMASCS has been exciting and varied, packed with interesting projects and valuable opportunities for new experiences and training. Below is a brief introductory overview of the requirements of this role. My main tasks revolve around assisting the UMASCS library team and taking care of the day to day operations of the MERL and Special Collections libraries. Each day is different as I complete a variety of tasks; I rarely spend a whole day sat at my desk. There are certainly lots of tasks to keep on top of, but it is this variety that I have enjoyed most whilst working at Special Collections! Every day I make time to keep up with shelving, of books used by readers in the reading room, that have been returned to our closed access stores and of new books. During University term time I will fetch books from the store that have been selected by the librarian and academics in the University for use in teaching (and await the later need to shelve them again!). I will also assist readers and colleagues if they are having trouble finding books. Here at UMASCS all members of the library and archive team contribute to the staffing of the reading room service. 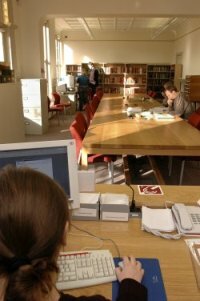 The reading room is mainly run by the archives graduate trainee (the Reading Room Assistant) and as the library trainee, I am likely to do 1-2 half day shifts a week in the reading room. Essentially this involves supervising readers in their use of collections, assisting readers with enquiries, fetching material from the store, registering new readers and coordinating enquiries on a wide range of topics from members of the public on the phone, in person or by email. I also collect and compile a range of statistics which are then made available to the librarian, on usage on the reading room (using our events booking software) and rare book and open access book usage. I often complete this task while on reading room duty. One of my more office based tasks is carrying out a range of different types book processing. I label books catalogued by the library team, using our labelling making machine called the Kroy, and shelve them appropriately. I have also been trained by our Conservation Manager to conduct book repairs, so I might spend half a day a week conducting small repairs, such as repairing pages and book jackets, replacing boards and cleaning books. I also bib check books donated to the library, this involves checking new titles against our catalogue to see if they are already in stock here or at the main library. I will assist the rare books cataloguer by beginning the cataloguing process by accessioning books, downloading records for new books from a database and editing those records before passing the item to the cataloguer. Sometimes I classify books using the MERL library classification, or withdraw items from our accession registers which are no longer required. Volunteers are a really important part of our work at UMASCS, I will often supervise and assist library volunteers and work experience students with their book processing tasks, such as labelling, bib checking and listing of uncatalogued collections. At @UniRdg_SpecColl and Beckett, Books and Biscuits: University of Reading Special Collections we have a social media presence through Twitter and our WordPress blog, which I regularly contribute content to. We are always looking to increase our output and impact by engaging with relevant events and trends. 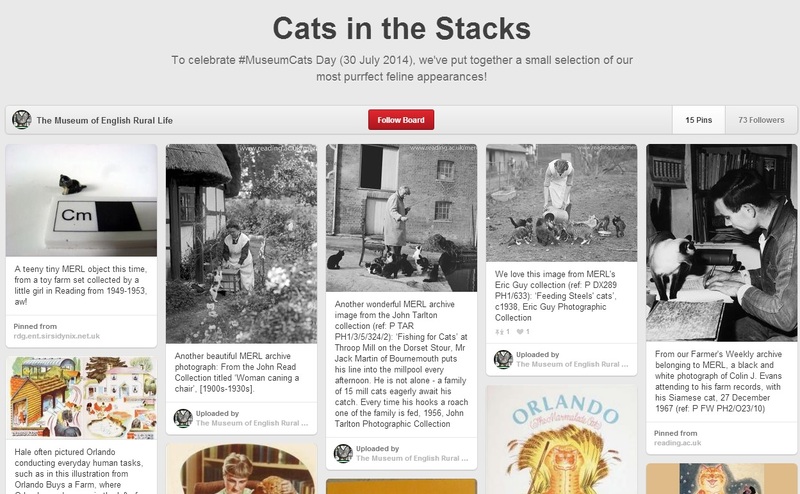 Sometimes we do this in collaboration with our colleagues at MERL, I recently spent a purrfect afternoon searching our collections for images of cats to mark #Museums Cats day (see above and http://www.pinterest.com/UoRmerl/cats-in-the-stacks/). On occasion I also do some web editing. Alongside these duties I will also attend regular staff meetings, heartily partake in regular tea and cake breaks, assist with exhibitions, occasionally visit our off site store and spend time answering library enquiries forwarded to me from other colleagues. So as you can see, life as a GT here at UMASCS is varied, exciting, interesting and a fantastic opportunity; the perfect grounding to pursue a career in Special Collections. Please apply here if you’re interested in the GT position for 2014-2016. This post was written by Aoife Lintin, one of the University of Reading’s UROP students. UROP (Undergraduate Research Opportunities Programme) placements provide exciting opportunities for undergraduates to work with staff on research projects across the University, contributing directly to the creation of knowledge and strengthening the link between teaching and research. Placements last six weeks over the summer break, or can be part-time over a longer period. The scheme is only open to University of Reading students in their middle years of study (ie not first or final year students). Further information on the UROP programme can be found here. 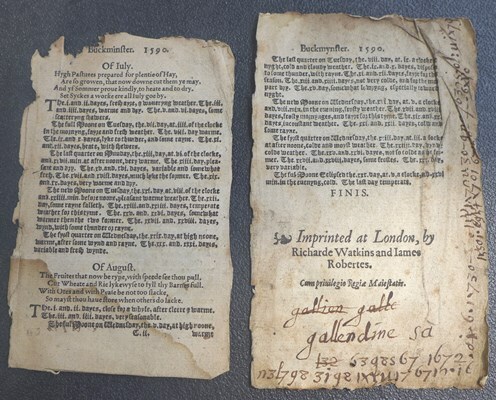 Leaves from a fragment of an almanac and prognostication by Thomas Buckminster (London,1590) RESERVE–528.2-BUC, University of Reading Special Collections. My name is Aoife Lintin, and I am studying History at the University of Reading. My tutor is Dr Anne Lawrence, a medieval historian specialising in the history of magic. Dr Lawrence is at present studying the history of weather forecasting. The purpose of my UROP project is to study almanacs. Almanacs were, amongst other things, the forerunners of the modern pocket diary, containing all sorts of useful information for the ordinary individual and household. These included an accurate calendar, dates for the full moon and lists of important dates and individuals, such as the kings and queens of England. They also made predictions for the weather and events of both political and national importance. They were important to the ordinary individual in the past as the calendar is to us today, and are in fact still published today. 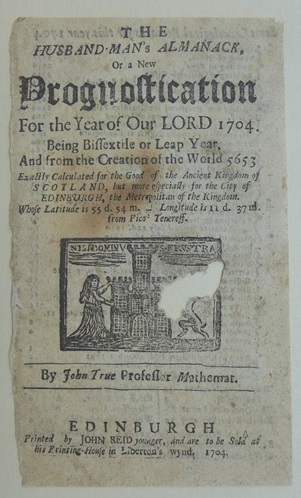 Fragment of ‘The husband-man’s almanac, or a new prognostication for … 1704’ by John True (Edinburgh, 1704) from the John Lewis Printing Collection, University of Reading Special Collections. The compilers of almanacs were scientific people who believed that as ‘the moon affects the tides then the planets must have an effect on the weather’. They used mathematics to work out the position of the stars and the planets and work out weather predictions from these. As the movements of the planets and stars can be predicted, the weather was predicted for a whole year from the previous autumn, thus using astrology to foretell the weather. The heavens were divided into the signs of the zodiac, and it was these that were used for the predictions. Scientifically this theory has lost credibility. It is true that the moon has an effect on the tides, but the theory that a distant planet like Saturn can have on effect on the weather has come into question. Today, meteorologists do not consider this form of weather forecasting to be valid. 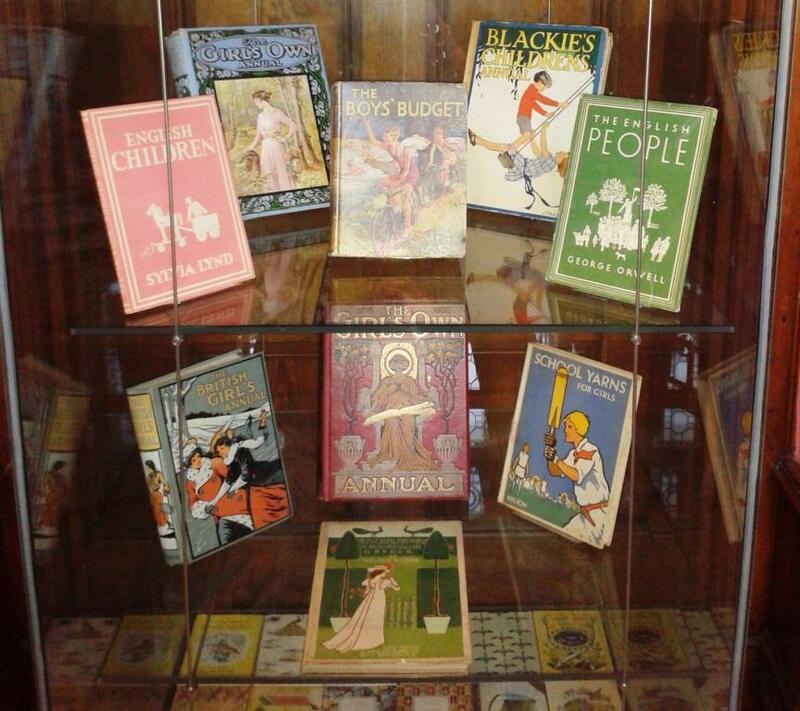 My UROP project is to study and make a catalogue of almanacs in different departments of the University. Many have not been catalogued or studied before. It was thought that weather forecasting or meteorology started in the nineteenth century, but this project proves that it started a lot earlier and it has been recorded as a practice as early as in the mid-sixteenth century. The research part includes a short study of duty charged on almanacs. This was made law in the reign of Queen Anne in 1712, and must have been very lucrative, as there was a ten pound fine for non-payment, a lot of money at this time. It was the refusal of the American colonies to pay duty on printed material, especially legal documents, that started the move to American independence. ‘No taxation without representation’, was their famous cry. This shows the importance of the duty tax at this time. The University’s rare book collections contain a bound volume of almanacs for the year 1807 ([Album of almanacs]. 1807 – RESERVE–529.5-ALB), and it is interesting to note that they give the same weather symbols and predictions for the weather for three of them. We know that weather forecasting is not an exact science. Was there a table for working out weather patterns? Or does this prove that compilers had a system that was universally accepted? It would be interesting to find out if the weather for 1807 agreed with these predictions. 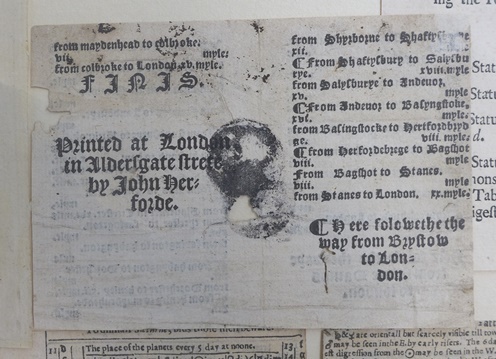 Fragment of an almanac printed by John Herforde from the John Lewis Printing Collection, University of Reading Special Collections. I have also been very excited to find a fragment of an almanac in the John Lewis Printing Collection printed by John Herforde who was in operation in the 1540s [see image above]. This could be the oldest surviving almanac fragment in the University’s Special Collections. Research into this fragment is the business of ‘historical detective work’ and valuable experience for me as a historian. At this point, I must mention the wonderful staff at the Special Collections reading room. They are wonderful, a joy to work with and have been making my introduction to archive research a pleasure. Thank you. The Matthews-Shelley Collection is one of our rare book collections, and was created by the Shelley scholar G.M. 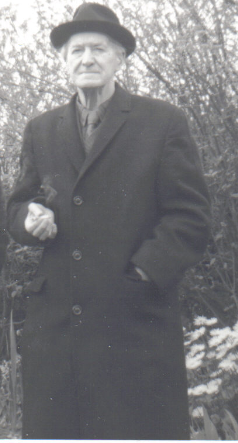 (Geoffrey) Matthews (1920-1984), Professor of English at the University of Reading. The collection contains items relating to the life and works of the Romantic poet Percy Bysshe Shelley, and is one of our lesser-known holdings but contains a number of hidden gems. 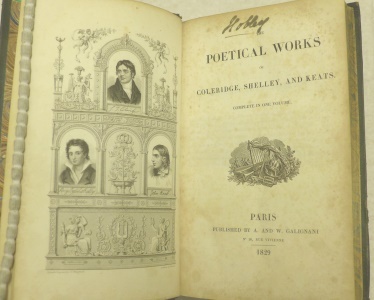 Among the editions of Shelley’s works in the collection is a rare first edition of The Poetical Works of Coleridge, Shelley and Keats, published in Paris by A. and W. Galignani in 1829 [see image below]. This important volume constitutes the first collected edition of Keats and only the second collected works of Coleridge and Shelley, and contains works published for the first time from all three poets. The collection also includes some beautifully illustrated editions of Shelley’s works. 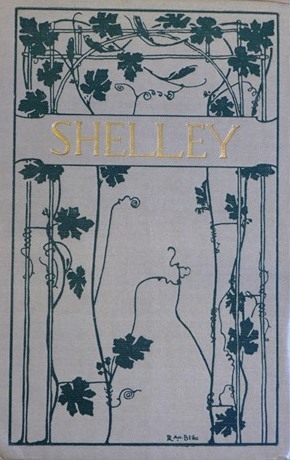 An edition of Shelley’s poems, published by George Bell and Sons in 1902 and part of the ‘Endymion Series’, features illustrations by Robert Anning Bell (1863-1933), who also designed the book’s elegant Arts and Crafts-style binding [see image below]. Anning Bell played an active role in the Arts and Crafts movement as one of its leading artists, and he designed book covers for a number of publishers including Dent, Bell, and John Lane. He also designed covers for two other publications in the ‘Endymion Series’: Poems by John Keats (1897) and English Lyrics from Spenser to Milton (1898). Other illustrated editions include a copy of Shelley’s poem The Sensitive Plant, with exquisite illustrations by another leading Arts and Crafts artist and book designer, Laurence Housman (1865-1959). This publication was printed in a limited edition on Japanese paper for the Guild of Women-Binders in London in 1899. 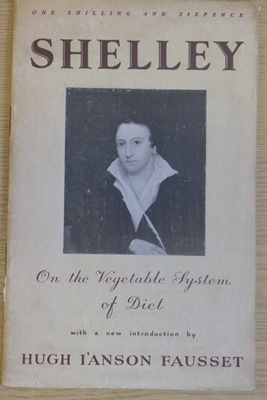 Other items of particular interest in the collection include an 1947 printing of an essay by Shelley on vegetarianism, entitled On the Vegetable System of Diet [see image above]. Shelley believed that a meat-free diet was the best mode of consumption for a healthy, disease-free life, and he wrote several other essays on vegetarianism, including A Vindication of Natural Diet (1813). You don’t need to be an expert on Shelley to access the collection – items are available to view on request to all readers in the Special Collections Service reading room. The collection is partially catalogued on Enterprise and there is also a handlist for the collection.